If you take a look at the banner above this post, you’ll find Maiden Castle looking down at you out of a frosty chilled sky. Always one of my favourite places, I jumped at the chance to read a novel about it, back in its Iron Age glory, populated by fierce warriors, terrifying druids and the finest craftsmen and women of the age. Age of Iron by Angus Watson delivered all that I asked for by the chariot load. Fiction it certainly is, there are no firsthand accounts of Iron Age Britain other than those written by Julius Caesar, the conqueror who couldn’t pull it off, and so Age of Iron is perhaps more fantasy than (pre)historical fiction. But how real it feels! The novel is set in the years immediately before Caesar’s much anticipated arrival and, as the preface states, ‘The following is what really happened’. And, after reading this bloody, thrilling and exhilarating tour de force of an adventure, who am I to argue? The year is 61 BC and the southern tribes of Britain are dominated by King Zadar, whose power spirals out from Maidun Castle (as it’s called here) to enclose all of the neighbouring tribes and hillforts. While many pay him an annual tribute of slaves, metal and crops, others are stamped out by his fierce army of male and female warriors, archers and charioteers. As the novel begins, Zadar has reached Barton. The inhabitants trust that he will march on by but Dug Sealskinner, a mercenary who was on his way to enlist in Zadar’s army but somehow got stuck instead with the responsibility of knocking Barton’s ‘army’ into shape, knows differently. And as Zadar’s fearsome elite female archers strike the first blows, Sealskinner knows there is nothing to do but run. Slaughter ensues. This is the world into which Angus Watson throws us. It is violent and life is short but he gives us three people who each have the power to make a difference. Dug, the ageing warrior who fights against all his kind instincts and occasionally wins, finds himself rescuing a young child scrambling around on the battlefield. Her name is Spring and she is extraordinary, surely one of the most enjoyable and three-dimensional children in recent historical fiction. Dug’s next new comrade is Lowa Finn, one of those very same female archers who fought and won for Zadar only for the band to be wiped out by him in jealousy. Lowa is the only survivor. She is fiercely independent, strong and fierce but even she realises that in order to claim vengeance for her murdered sisters she needs help. With the hammer of Dug, the cunning of Spring and the deadly precision of Lowa, this is a band that can do some harm to Zadar. He’s not just going to stand around and wait for them, though. Zadar is a formidable opponent and by his side he has the most dangerous and skilled of all of the druids. Protecting them both are the walls, ditches, gates and lethal traps of the impenetrable Maidun Castle. 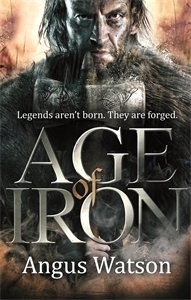 Age of Iron is one of the most exciting novels I have read in a long time. From start to finish there is never a pause in the action. Dug, Lowa and Spring take us on a journey across Iron Age southern Britain as they travel in pursuit of Zadar, honing their skills, getting to know each other, fighting their way from fort to fort, town to town. Their trip is marked by numerous memorable adventures, many of which it’s a miracle anyone can survive, and the people they meet prove time and time again that Dug is right in his philosophy of life – never trust anyone and never help anyone – that he can never keep. The action, though, is matched by the characterisation. I absolutely adored all three heroes. Each has a unique personality and voice, and dangerous and nasty as all three can be and often are, I was egging them on through every page. Spring adds something very special indeed. She is a most unusual child and the mystery and skills she carries with her adds an extra valuable layer to the novel. It is so hard not to like Dug. We arguably get closer to him than to anyone else and he’s a source of worry for much of the novel. The reader can only guess at what he’s endured during his relatively long and difficult life. There is little here that is fantastical (although the tribes have fictional names) but the druids inevitably raise the promise and menace of dangerous magic. There is not too much of that but the real threat of the druids in this novel is shown in their utter brutality and venality. There is a suggestion that not all druids are mad and bad but there is horror by the ton not to mention gore, violence, pain, and a vivid imagination. Angus Watson writes so well. His powers of description are excellent and he keeps more than one wry eye on the future, too. The mention of festivals by the tor made me chuckle and there are lots of lines that raised a smile, just as there were plenty of gory, bloody moments that made me glad I was sitting down. Another aspect I enjoyed is the frequent speculation about what will happen when the Romans invade, as everyone is so sure that they will. This Iron Age society is a relatively equal one, with female warriors and rulers. These women are under no doubt that their value will drop in a Britain ruled by Roman men. The prehistoric landscape of Britain is a magical place, its clues are all around us in its monuments, hillforts and metal hoards, but it is both familiar and strange, and always fascinating. In my archaeology days, I dug more than my fair share of enigmatic Iron Age remains. There is so much we cannot know. But Angus Watson makes a stab at it and, fiction though it may be, during the time I was immersed in Age of Iron I was willing to believe every word of it. I cannot wait for the next stage in the adventure – Clash of Iron. This entry was posted in Fantasy, Historical Fiction, Review and tagged Fantasy, Historical fiction on October 14, 2014 by Kate (For Winter Nights). Heard lots of cool stuff about this one. Definitely one to add to the TBR pile. It’s a fabulous book! I can’t recommend it enough. I REALLY enjoyed this, and I’m a bit mystified as to why it isn’t getting more attention! I’m waiting impatiently for Clash of Iron as well, I was pleased to learn it will be coming out in April. Gotta love that release schedule!